One of the few true one-stop solutions for controlling Native Instruments Traktor. Great build quality. Useful multifunction rotaries/buttons. Stereo input. Mapping not perfect. Jog wheels spin a little fast. The Digital Jockey 2 has a pretty standard layout. This version of the Digital Jockey 2 benefits from audio I/O. Branded with the Traktor logo, this controller squarely aims itself at the fast-becoming users of NI's Traktor Pro software and comes packaged as an all-in-one solution complete with a built-in audio interface. In the box there's an installation CD complete with Traktor LE, a USB lead and a power supply (although the unit powered ﬁne over USB, it's recommended that you use this). Up front there's a crossfader curve adjustment rotary, a headphone jack and a microphone input. These inputs both have individual EQ rotaries which effectively work like tone controls, but are a welcome addition nonetheless. There are decent sized, touch-sensitive jog wheels and good fader actions - the whole unit feels sturdy without weighing quite as much as other controllers such as the Vestax VCI-100. Around the back the connections are RCA stereo outputs and RCA stereo inputs which can be switched from line-in to phono for connecting a turntable and routing it to a third 'Audio Thru' deck in Traktor. Once you've installed the drivers and plugged the unit in, you have to hunt down the Traktor TSI ﬁles that hold all the mapping information. This proved to be a bit of a pain as the Reloop website only has these as downloads within their forum, which you have to register on to see the download links. Most new users will ﬁnd the preset mappings very usable, but tweaking within Traktor's MIDI mapping preferences may be required depending on your preference. Loading tracks into deck A and B is simple, with a push of the large central rotary switching the Traktor track browser to full screen. You can turn the same rotary to scroll up and down or, alternatively, you can use the jog wheels to browse the ﬁle tree or tracklists separately. "Most new users will ﬁnd the preset mappings very usable, but tweaking within Traktor's MIDI mapping preferences may be required depending on your preference." Using the white backlit shift button switches the plus and minus pitchbend buttons into close and open folder buttons when browsing, which is useful but awkward to use as you have to shift and then remember to un-shift to scroll the tree again. But, of course, this could be remapped and modiﬁed to work better for you if you wish to create your own custom MIDI map. All the EQ and effects rotary controllers also work as push buttons. This works great for kill switches and turning the ﬁlters on and off, but means you have to be relatively careful not to push them by accident if you get a bit over excited in the DJ booth. Overall, it's hard to fault the controller itself (apart from the jog wheels maybe spinning a tad fast) as the majority of the gripes rest with the mapping choices. 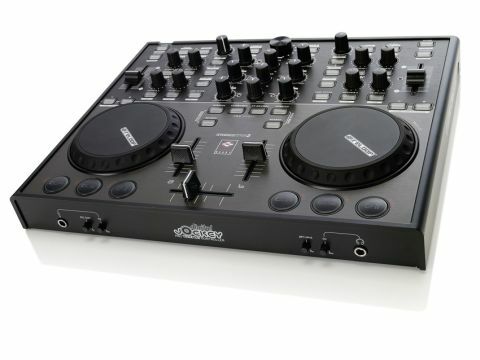 If you take the time to ﬁnd the right mapping of the controls, this becomes one of the best all-in-one DJ solutions on the market, with plenty of knobs and buttons in a well-thought-out layout. It may not be the perfect Traktor controller yet, but this one certainly gets pretty darn close.